In my hunt for a replacement for my favourite, sadly lost bag, there is no one I have resembled more than Goldilocks. My requirements for a bag? Not too big, not too small, not too expensive or too cheap looking. I don’t like lots of frills nor a bag that is so obviously from a particular season that it will date quickly. I prefer something with looks verging on the traditional and utilitarian, rather than over-feminine and it must be great to look at and great quality. I also prefer to be able to wear a bag diagonally across my chest to keep my hands free when I’m with the kids to stop them flinging themselves towards whatever danger they can find. Most importantly, and this might sound a bit odd, but I really need to love the things I own. This isn’t meant to sound as though I’m advocating collecting lots of possessions, because I don’t have a lot of things myself, but if I’m going to spend money on something, it needs to be exactly right. Not just good enough. I want to have things that I can create memories with. Which is why everything I buy takes a lot of deliberating over. I’m certainly not an impulse shopper! See what I mean about Goldilocks? Thankfully I recently discovered the Cambridge Satchel Company. Handmade in Britain, and with a range of satchels in several sizes, batchels (with a top handle) music bags and backpacks, all in a rainbow of colours, it’s a company whose website I have spent ages poring over recently. If you order online they can also add embossed initials to personalise your bag even more. The Cambridge Satchel Company make this satchel in a lovely array of colours. I decided on the metallic silver because I wanted to inject a bit of boldness into what I wear every day instead of going for a more traditional colour. I love the contrast between the traditional satchel shape and the contemporary silver. Also, silver works really well as a neutral with whatever other colours I’m wearing. Since buying it, I’ve used it every day which is the ultimate test and it’s passed with flying colours! 6 Responses to Silver Satchel. Oh thats a nice satchel i wonder how they make the leather silver?? 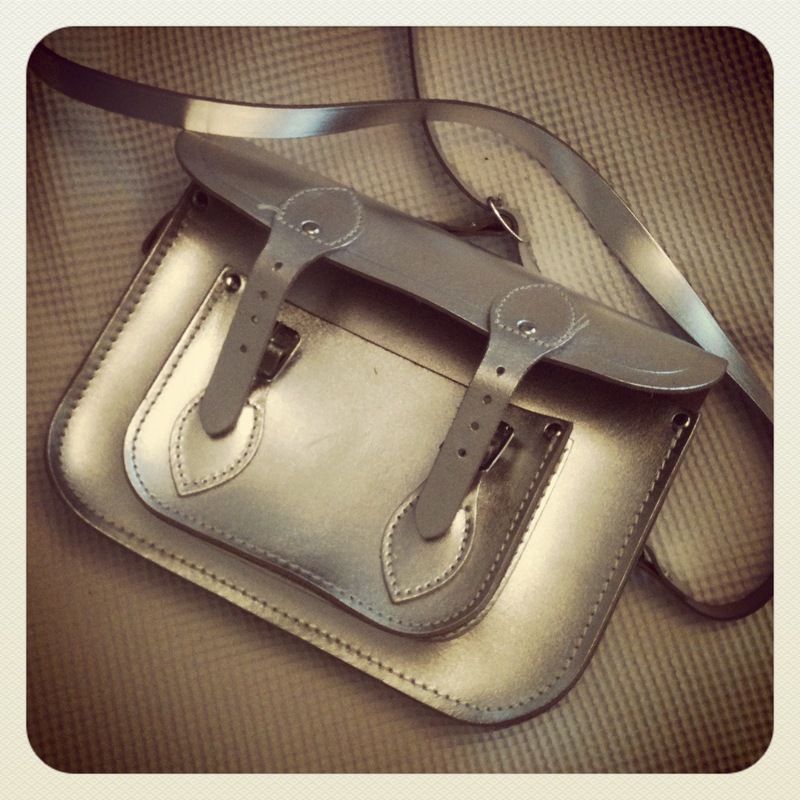 Pingback: Love All Blogs » the altruistic blogging network and showcasing site that welcomes all bloggers » Silver Satchel. I’ve just discovered these satches and now I want one like yours! I might have to scramble, though, since they’re now end of line. Can I ask what size you ended up with (ie what was ‘just right’ for you) and what you can fit in it? Also, it seems there’s both a gunmetal and a silver (possibly also a pewter) and ASOS claim they have an exclusive on the silver… Which shade would you say your bag is? Thanks for your advice! I bought the smallest size that Cambridge Satchel Company make – which I think is 11 inches. It’s quite small though. I can fit in; purse, phone, small makeup bag, keys and that’s about it. If I bought another, I might go for a bigger size as I like to be able to carry a paperback novel with me – and if I put one in this bag, there’s no room for anything else! I think mine is ‘silver’ as opposed to gunmetal, and I bought it from Harvey Nichols in Leeds. Not sure if they still have them though, as like you say, I think it was a limited run. Good luck with your shopping!